As another Diabetes Blog Week draws to a close, let’s reflect on some of the great bloggers we’ve found this week. Give some love to three blog posts you’ve read and loved during Diabetes Blog Week, and tell us why they’re worth reading. Or share three blogs you’ve found this week that are new to you. 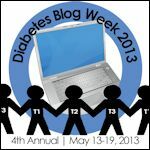 I had a blast this week reading and writing for Diabetes Blog Week. And I look forward to doing this again next year. It was really fun to read and meet new bloggers/diabetics, and it was also really fun to share my experiences. And because this was so much fun I will be on the two wildcard topic later in the week. So be on the look out for that! This entry was tagged Blood sugar, Conditions and Diseases, DBlogWeek, Diabetes, Diabetes Blog Week, Diabetes Blog Week 2013, Diabetes mellitus, Diabetes mellitus type 1, Diabetes Online Community, DOC. Bookmark the permalink. Wow thank you! I’ve really enjoyed reading your posts too 🙂 Looking forward to reading many more. You are very welcome. I also look forward to reading more posts by you. Thanks for the shout out, Paul!! !